Mort Künstler will sign prints of “Shenandoah Strategy,” a night scene featuring Stonewall Jackson, from 10 a.m. to 3 p.m. Saturday at King James Galleries, 161 Prosperity Drive, Winchester. Winchester — Mort Künstler, isn’t ready to lay the Civil War to rest yet, but he is getting closer. The artist has announced he will do a series of eight Civil War paintings over the next three years before retiring from the genre altogether. The series, titled “A Tribute to the Legend,” will feature historical locations, personalities and events that are special to Künstler, 81, of Oyster Bay, N.Y. 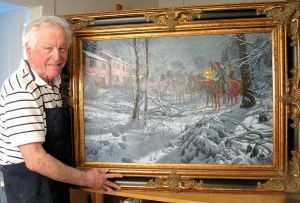 The first painting in the series, “Shenandoah Strategy,” will also be the last of Künstler’s annual snow scenes, he said. Prints will be sold at a signing from 10 a.m. to 3 p.m. Saturday at King James Galleries, 161 Prosperity Drive, Suite 104, Winchester. The signing is part of a larger weekend of events that includes a dinner from 6 to 9 p.m. Friday in the ballroom of the George Washington Hotel and a book signing for the newest book of Künstler’s paintings, “For Us the Living,” from 1 to 4 p.m. Sunday at the Museum of the Shenandoah Valley, 901 Amherst St. The projected end for the series will be April 9, 2015, the 150th anniversary of the Confederate surrender at Appomattox Court House. The last painting will depict the signing, he said. The activities start with Friday’s “An Evening with Mort Künstler,” a fundraising dinner at the hotel for the Mort Künstler Endowment Fund for the Timber Ridge School, said Troy Newbraugh, director of development. A reception starts at 6 p.m. and dinner will be at 7 p.m. In addition to the dinner, guests will be able to watch Künstler create a live charcoal sketch, which will probably be related to the Civil War, Newbraugh said. Tickets are $100 per person. To reserve a ticket, call 540-888-9523. At the official unveiling of Künstler’s 2012 snow print at King James Galleries, the artist will sign prints of “Shenandoah Strategy,” a night scene featuring Stonewall Jackson. He is on horseback surrounded by several of his men in woods near Glen Burnie and he is using a lantern to read a map. “I think it is one of the best paintings I have ever done, so I am very happy with it,” he said. The event is free and open to the public. Print prices vary. The weekend ends with a book signing at MSV of the collector’s edition of “For Us the Living,” the book featuring Künstler’s work about the 19th century. The text of the book was written by James I. Robertson Jr. and the foreword by Harold Holzer, who is a foremost Lincoln expert. He is a senior vice president at the Metropolitan Museum of Art. The title of the book came from a line in the Gettysburg Address. The cost of the coffee table book, which was released in October, is $50, he said. Though Künstler is stepping away from the Civil War, he is not leaving the war genre altogether, he said. 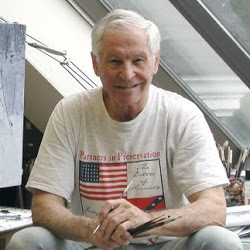 He is shifting his focus to the Revolutionary War with several commissioned paintings and a book planned on the subject. As with his first foray into depicting the Civil War, the Revolutionary War paintings started with a commission. He did a painting of Gen. George Washington crossing the Delaware River that is more historically accurate than Emanuel Leutze’s iconic 1851 piece.